A company whose workers are happy is leagues beyond one whose workers are miserable. Corporations rely on energy, communication and efficiency among their workforce in order to innovate and produce. When busy periods hit and things get stressful, bad morale can spread through a company like the flu if there isn’t an end in sight. Companies whose workers report high morale display roughly 20 percent better performance than their peers. A 47 percent boost in company value can come from prioritizing the happiness and satisfaction of employees. Recreational corporate retreats provide the perfect avenue for companies to inject a dose of camaraderie into their ranks. Providing a fun getaway for employees is an investment that pays off demonstrably in both the short and long term. Why Choose a Recreational Corporate Retreat in Tennessee? The southeast corner of Tennessee has all the makings of a successful retreat: mountains, water, sunshine and quiet. The climate here is warm in the spring and fall and hot in the summer, with more than enough rainfall to keep things green and lush. Birdsong tends to fill the forest and long, seductive tendrils of fog are coaxed out of the trees by the morning sun. In short, it’s a lush, happy paradise. In terms of corporate retreats, this translates to more time spent outdoors and a jubilant effect on the spirit. It is an easy climate to enjoy and is rarely disagreeable — save for the afternoon heat, which is as easy to cure as jumping into the crystal clear waters of the Ocoee River. The Ocoee River flows in a northwesterly direction and contains some of the most spectacular rapids on the east coast. At Raft1, this river is a central point for activities and serves as a launchpad for many of our corporate retreats. Tennessee is a state with a rich history, stunning landscapes, temperate climates and a laid-back attitude. We capitalize on all of these qualities to provide the best corporate retreat in the industry. An emphasis on the big picture: One of the biggest elements of great team dynamics is the ability of everyone to see the larger, grander idea they are working toward. By removing employees from their everyday routines and freeing them of their detail-driven schedules for a few days, you are allowing everyone the chance to focus on the big picture. This is a morale booster in its own right. After a day tackling rapids and splashing around in the Ocoee River, you can host discussions about the larger mission behind your company. Workers can get to know each other: The hustle and bustle of office life can prevent workers from getting to know each other on a deeper level. Additionally, plenty of companies these days are composed of remote teams. At a certain point, it can all start to feel robotic. A rafting trip not only allows people to bond over a fun activity, but it also gives people downtime to talk and understand each other as individuals. This leads to better communication when working. Employees bond over being in a new place: There’s a reason why it’s easier to make friends in college than later in life: everyone there is bonding over a new experience. At a corporate rafting retreat, plenty of employees will be experiencing some activities for the first time. The act of being in a new place together is a powerful enzyme for connection. It can be a great stage for changing directions: If your company is looking for an engaging way to announce changes or even host a discussion about the future, a rafting trip is one of the most personal and disarming ways to do so. Have fun during the day, build teamwork and then use that good energy to have a productive discussion on how to grow. It shows your employees you care: These days, running a successful company isn’t as easy as paying a decent wage and expecting everyone to fall in line. Workplaces are operating with an increasingly humanistic concern for their employees. Companies who make the effort to show they care stand above the rest, making happier employees and attracting better hires. Preaching at people: Corporate retreats in which employees are shuttled off to a faraway location, only to be lectured at length and treated to boring keynote speakers, are a special brand of boring. If there is information to cover, put it in a video and have people watch it before they come on the retreat. Distributing cheap mementos: If you want to give everyone a cup with the name of the retreat on it, that’s fine — but don’t expect it to count for much. Good corporate retreats rely on experiences and real discussions, not souvenirs, to be memorable. Being afraid to introduce some edge: Vague, carefully-worded pep talks about the company’s bright future only go so far. Bringing a bit of edge to a corporate retreat sets the tone for fun, openness and productivity. Edge can come in many forms: a CEO confessing mistakes and how they plan to overcome them, or a workshop in which employees brainstorm a company that could drive their own company out of the market. These activities establish the retreat as a place for innovative ideas to come to life. Not budging on your company’s values: If the company’s core purpose needs work, a retreat is a perfect time to wipe the slate clean and crowdsource some fresh ideas. This has the added benefit of letting the whole company get involved in the core mission, which will leave them with a new sense of understanding. Incorporating cringey icebreakers: No one wants to do trust falls on their corporate retreat. The spirit of openness and progress should be equaled by the excitement of the retreat’s key activity. 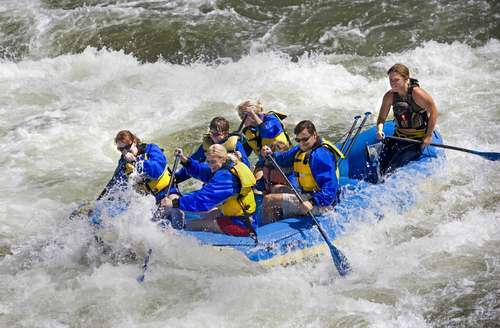 Whitewater rafting is the perfect way to perform a team-building exercise without employees even being aware of it. The experience of rafting is one of laughter, shouting, cooperation and adrenaline — and the result is a team that leaves the retreat flushed, excited and reinvigorated. The tone of panels, keynote presentations and town hall-style meetings is much more engaging when people have bonded over a new experience. Whitewater rafting the Ocoee is about as much fun as a group can have in a day, creating the perfect atmosphere for ideas, friendships and motivation to blossom. Imagine waking up to the sound of birds singing in the dense canopy above with the river babbling happily along below. There is that strange, fun moment where you wonder where you are — and then you realize you are on day two of the retreat and that your coworkers are all there with you. If the goal of a corporate retreat is to remove workers from their everyday environment and jolt them with a fun experience, and an overnight rafting trip is the perfect way to do so. Taking an overnight corporate group trip allows everyone to truly break from their routines and commit to the retreat. Raft1 is one of the few companies in the east who offer overnight corporate rafting trips. In doing so, we have developed an approach that guarantees a great experience for attendees. It all starts with our package rates and willingness to customize. The larger your group, the lower the cost per person. For groups of 15 or more, we offer customized trips and opportunities. That means we will work with you to incorporate different activities and team-building exercises into your trip on the Ocoee to create an unforgettable trip for your group. Our overnight trips are available many months of the year. While we do not run rafting trips during the coldest winter months, we do operate late into October. We are one of the only rafting companies to do so, and we sometimes wonder why — October is a fantastic month for rafting! The water and air is still warm and there are very few crowds on the river. In our minds, it’s one of the best months for rafting. Overnight trips present several options for lodging. The first option is the Lodge at Raft1. If you would like everyone to sleep in a single bunkhouse, this is the choice for you. This log cabin-style bunkhouse sleeps 44 people in individual bunks, with four separate bunkrooms on two levels. With the help and inspiration from sites like https://cosysleep.co.uk/, each bunk comes with a comfy mattress and all guests have to bring are their sleeping bags, pillows and towels. In the kitchen, guests will find a refrigerator and a microwave for use. It is the rare person who enjoys sleeping in a sweltering hot room, but that’s not a concern at the bunkhouse — it is fully equipped with mercifully cool air conditioning. It also contains two half-baths for trips to the toilet, while showers are located in the main bathhouse just a short walk down the hill. This bunkhouse has a large living room and a deck, both of which are perfect for socializing, relaxing, playing games or having meetings. The deck is even equipped with picnic tables and grills for cooking out. If you should want to have a bonfire, just head into the woods behind the bunkhouse and start one up in the provided campfire ring. The lodge costs $15 per person per night, with a minimum of $250. The bunkhouse is a cool, comfortable space that allows a large number of guests to sleep indoors. Choosing it for lodging simplifies transportation needs, consolidates your event and provides a built-in meeting space. If you think your group would enjoy being out in the elements a bit more, we have a number of campsites available for pitching tents. These campsites lie just uphill from the bathhouses and offer space for tossing the frisbee or going on a quick hike into the woods. Purchase firewood locally to avoid spreading invasive pests — there are plenty of firewood vendors nearby. Also, be sure to bring your own water, garbage bags for trash and wet clothing, a grill for cooking out, lanterns and flashlights, fire starters, towels, folding chairs and tents with a ground cloth and rainfly each. Individual campsites can accommodate tents up to 10 feet per side. Conveniently, you can drive your vehicle up and park just in front of the sites, with the farthest site being only a short distance from the vehicle. As these sites are available to rafters and visitors alike, they are on a first come, first serve basis. Each campsite costs $5 per person, per night. Nothing rounds out a trip quite like good food. At Raft1, we take the experience further by offering fresh, farm-to-table food for corporate groups. After a day of rafting, your group needs to be nourished with filling, wholesome and delicious food. We make sure that our food is an integral part of the journey and not just a means of assuaging hunger. Picture tender, local meat and fresh vegetables, marinated and grilled to perfection by your raft guides. That’s right: your raft guides will be doubling as your gourmet chefs. They will impress you with their culinary prowess! Simply call ahead to discuss any allergies, dietary restrictions or other food requests and we will work to accommodate them. Ziplining: What better way to thrill your workers than by sending them soaring through the forest canopy? We will navigate through the upper forest from sky towers in the treetops to suspension bridges. This is also a great activity for team-building and fun. Mountain biking: With the Ocoee River area and Cherokee National Forest in our backyard, there is plenty of opportunity for fantastic mountain biking. Talk to us about adding a mountain biking excursion to your corporate retreat. Art classes: For quieter moments, local artisans can provide art classes for your group. This relaxing, fun class holds the potential for unlocking new talents and passions and provides a soothing mental counterpoint to an otherwise exciting trip. Cookouts: Everyone loves a cookout, and coordinating one with Raft1 is a guaranteed good time. Our local artisans can participate and you can decide what type of food you’d like to make. We have one-day, two-day and full weekend packages available for corporate rafting retreats. If you have a specific request of any nature, simply contact us to discuss it or call at 1-888-RAFT-ONE (888-723-8663). We know there’s no one-size-fits-all solution for corporate groups eager to improve teamwork and productivity, so we’ll work directly with you to make your group’s trip unforgettable.